The Mexican-American music scene hit repeat the night of Dec 8, 2012. Another rising star was taken away from their fans. Jenni Rivera was the Queen of Banda, a regional type of Mexican music. At the time of her death, I had heard of her, but it was mostly connected to her reality TV show. Given my bias against most things reality TV, I ignored additional news of her...that was until that night. 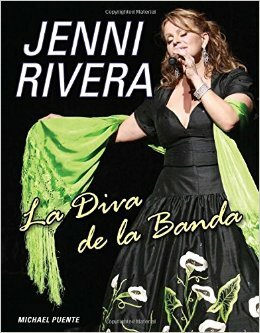 A chronicle of Jenni Rivera's life, her career, her achievements and her untimely passing through published reports and additional reporting. Fans of Jenni will enjoy the full-color photos and interesting details about her life. It is true. This book is a definite coffee table book not one to sit on a shelf. There are a lot of photos in this book that document a career and life cut short. Rivera was not just a singer who sought the cheap limelight of reality TV, rather she was a former teenage mother turned shrewd business woman. After being kicked out of her parents home as a 16-year-old pregnant girl her teachers would not let her become a statistic. Instead she finished high school and eventually earned a college degree in business. As Puente quotes Rivera, she was a business woman who decided to go into music. Puente cites her business acumen as one of the most surprising things he learned about Rivera and I agree. "She didn’t leave any detail to chance but calculated every move." As I was learning about her business chops and knowing about her teen pregnancy, I was obviously thinking, "WHOA! What a role model!" Alas, Jenni did not want to be one. But she also knew she was and as Puente told me too it very seriously. This is a woman who didn’t allow setbacks to get in the way with her being successful. Take away her fame, fortune and legendary career, even after becoming a mother at an early age, she still managed to graduate from college, raise a family and start a career in real estate. That alone takes a lot of self-determination to do. Of course, she didn’t stop there, moving forward on a singing career. Jenni was no doubt a role model to women of all ages for a variety of aspects. Jenni knew she wasn’t perfect but that’s what made her real and that’s why her fans loved her so much. Jenni drove her music business, from recording, to promoting to distribution. Her determination led her to become one of the biggest reality stars on Spanish-language TV. She also had her own radio show and started to move into films. As someone once said about Jenni, she was always about the next project or the next thing to come. She wasn’t comfortable with standing in the same place. Today, many Latino artists are respected for being musicians first. Of course, we may not be seeing as many crossover artist as we once did like back in 1999 and 2000 when Ricky Martin and Marc Anthony crossover from being primarily Spanish language singers, although Pitbull and Shakira seem to be exceptions. There's no doubt that Latino artist can rise and be successful for their music. If you look at up and coming artist such as Ariana Grande, Becky G, Demi Lovato, Bruno Mars and Prince Royce, those are Latin artists who are viewed more for their music than being Latino although the culture is still a big part of who they are. As for Jenni, she had plans on recording an English language album and there’s little doubt she would have been successful. She listened to and was influence by English language pop, rock, rap, hip hop and R& B music. From my understanding, Jenni recorded some rap, hip hop type English tunes back in the mid 2000s. There’s a chance that music could be released by her family one day. But recording in English or not, I believe Jenni would have always remained true to her bread and butter Spanish-language music. They don't call her the "Diva de la Banda" for nothing. And sadly this is what happens when someone dies as they are ascending to bigger and great things...we speculate what ifs. While Banda music is not my cup of tea, I do need to tip my hat to Rivera. She was a force to be reckoned with and that alone is enough to miss her. To learn more of "Diva de la Banda" and support Viva la Feminista, please purchase your book through Powells or Indiebound. Disclaimer: I received an e-version of the book for review and access to the author for this blog post.